The builders replace many of the exterior panels with carbon fiber pieces to save weight. Today, the first-generation BMW M3, known by enthusiasts from its E30 chassis designation, is an absolute classic, and values are growing in the collector market. A new owner who's used to modern performance vehicles might find the original four-cylinder wanting for power and the interior plastic not up to current standards. The British firm Redux now provides an answer by building an E30 M3 restomod that updates the vintage model. It is making just 30 of them as an initial production series, and the first customer delivery is now done. Redux works under the motto – Enhance. Evolve. For the E30 M3, it takes the 2.3-liter four-cylinder and increases the displacement to 2.5 liters. The buyer of this one has Redux incorporate a turbo into the engine, but the firm also offers a naturally aspirated version. This application offers 390 horsepower (291 kilowatts) and 390 pound-feet (529 Newton-meters) when running at 14.5 psi of boost. The power runs through a six-speed manual gearbox, but a close-ratio five-speed in another option. A limited-slip differential is at the rear axle for additional traction. Three-way adjustable dampers keep the rubber on the road. Braking comes from AP Racing six-piston calipers in front and four-piston stoppers in the rear. Later builds have carbon-ceramic discs as an extra option. Redux pays similar attention to the M3's body. It media blasts the pieces and does any necessary restoration. The bumpers, fenders, roof, and side skirts are now carbon fiber. Later cars have a carbon hood as an additional option. The interior gets loads of Alcantara, including for the headliner, door panel trim, and center console. Occupants sit in leather-wrapped Recaro seats. The rear seating is gone, and there's just a simple bench back there now. One of the few changes we might make is replacing the digital instruments in place of the original analog pieces that have an iconic simplicity. · The BMW E30 M3 | Enhanced and Evolved by Redux. Creating an even more engaging driving experience for fellow E30 M3 enthusiasts. Thermal, CA - Redux is delighted to announce the delivery of its first enhanced and evolved BMW E30 M3 to its owner in Southern California. 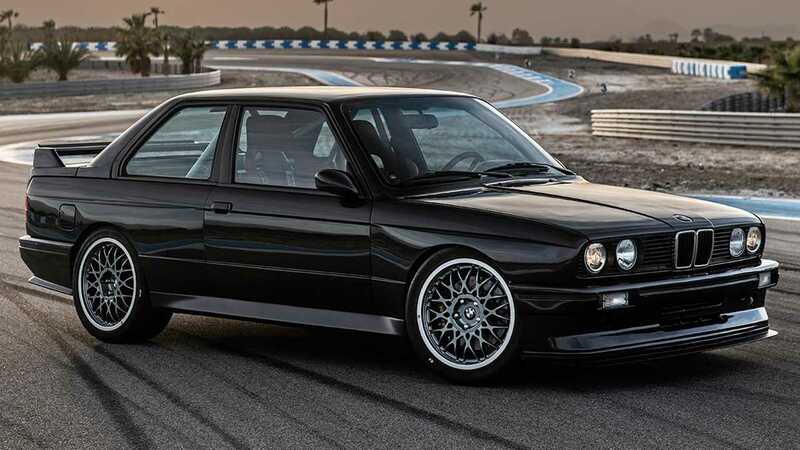 The E30 M3 is the first in a limited edition series of 30 vehicles. All restorations will feature tasteful and high-quality upgrades including carbon fiber bodywork, an Alcantara, leather or cloth-trimmed interior (or combination of all three) tailored to each client, performance upgrades inspired by BMW’s motorsports heritage, and a choice of either naturally aspirated or turbocharged re-engineered 2.5l, S14 engines. The idea for the BMW E30 M3 began as a personal project for CEO Simon Lord, but it soon became apparent that his vision could be something much bigger in scope and could be shared with other automotive enthusiasts. Since then Lord has set about building a team of like-minded BMW aficionados to turn that vision into a reality. The result is a fully restored and tastefully modified homage to the box-flared ‘young timer’ classic. Each Redux restoration is based on the E30 generation of the BMW M3. While a standard E30 3 Series was considered as a donor, the M3 model was a necessity primarily for the Paul Rosche-designed 4-cylinder S14 engine, unique to the first generation M3. In order to gain horsepower, many suggested the tried and tested method of swapping a BMW S54 6-cylinder, S65 V8 or even S85 V10; however, retaining the S14 engine was non-negotiable. As confirmed over dinner with an ex-E30 M3 racing legend, the naturally aspirated DTM-spec 2.5l S14 delivered 380hp with a red line of 10,000 rpm! However, this necessitated frequent rebuilds and was therefore not a viable option. With the M10 block’s turbo heritage – i.e. the 1.5l ‘Megatron’ turbocharged, championship winning, F1 engine – Redux aimed to match the S14’s DTM performance figures using forced induction. This was the option chosen by the owner of the first vehicle, resulting in 390hp and 390lb/ft torque (at 1.0bar/14.5Psi boost). Once the engine decision was made, the same logic was applied to the rest of the car with the goal of further developing the E30 M3 without moving too far away from the original: Enhance. Evolve. Redux offers its clients a concierge service for sourcing a donor BMW E30 M3. With a network of contacts throughout the UK and Europe, we can help find the right base vehicle on which to build your E30 M3 | Enhanced and Evolved by Redux. If you are able to supply your own donor, we can help manage the logistics for its collection and return. In North America, Enthusiast Auto Group is Redux’s distributor, donor supplier and logistics partner. Based in Cincinnati, Ohio they have an unparalleled reputation for supplying the best quality 'young timer' generation of BMW Motorsport vehicles. Each build starts with a thorough inspection of the vehicle, followed by a methodical removal of every component. Before undergoing a complete restoration, the shell’s paint is removed by media blasting. The rust damaged sections are repaired, mounting points fitted for new components, and a number of unique features created. (Whilst many of Redux’s customers will opt for a road car set up, a track-ready version with a half or full roll cage is available, as chosen by the first owner). The engine is stripped down and re-engineered from 2.3l to 2.5l; custom connecting rods, pistons, and a BMW Motorsport crankshaft are fitted. Due to the forced induction engine’s high torque figure (390lb/ft), the gearbox is overhauled and a custom flywheel, and twin plate clutch fitted. The rear end features an upgraded differential, and heavy-duty custom drive shafts, along with a larger diameter, custom propshaft. Finishing off the underside is a hand-fabricated, steel exhaust system with rear silencers (as the first owner lives in California to conform to CARB emissions for road use, a center section can be swapped out on v-bands to fit the two catalytic converters). To compliment the upgraded drivetrain, EXE-TC Competition Suspension developed a set of bespoke 3-way dampers for the car. The UK-based company has a storied motorsports history, having assisted Sebastian Loeb in winning multiple World Rally Championships, claimed the Isle of Mann TT and Nürburgring 4-door saloon lap records in partnership with Prodrive and Subaru. Combined with the AP Racing 6-piston front calipers (330mm rotors) and 4-piston rear calipers (304mm rotors) the suspension behaves in an assured manner in all conditions. Once the fabrication, engine, front end and rear assemblies, and custom parts are ready, the dry build begins. After all parts are test fitted and any final adjustments made, all components are removed again, and the shell thoroughly cleaned. The shell is meticulously worked through to ensure all signs of fabrication are smoothed out. Once primed and block sanded, the painter applies a water-based, Glasurit 90 line paint scheme. Finally, progressively higher compounds of grit sandpaper remove any minor imperfections in the paint including textures in the clear coat (orange peel), runs or drips. This is all done by hand before polishing to a mirror finish. With the shell painted, the drivetrain, front and rear assemblies, Raychem wiring looms, Motec hardware, and sound proofing material are refitted, all of which requires considerable patience and a very steady hand. Although the cabin has a familiar look and feel, it features a considerable number of bespoke interior components. Redux’s first restoration will spend most of its life at a private members’ circuit in Southern California, so a full roll cage has been fitted in order to ensure the owner remains safe. The interior is tastefully trimmed in Alcantara and leather, and fitted with plush wool carpets. The A pillars, B pillars, front and rear door cards, and headliner are all heavily modified and re-trimmed in Alcantara, and the rear seats have been deleted and replaced with a removable rear bench. The trunk allows access to the battery, diff pump, fuel pump, swirl pot, and rear PDM via an Alcantara-trimmed drop down panel. Build time: 18-24 months per vehicle.